Sustainable Developmental Goal 11 (SDG 11) aims to make cities and human settlements inclusive, safe, resilient and sustainable. According to the World Bank, population-weighted exposure to ambient PM 2.5 pollution is defined as the average level of exposure of a nation’s population to concentrations of suspended particles measuring less than 2.5 microns in aerodynamic diameter, which are capable of penetrating deep into the respiratory tract and causing severe health damage. Exposure is calculated by weighting mean annual concentrations of PM2.5 by population in both urban and rural areas. 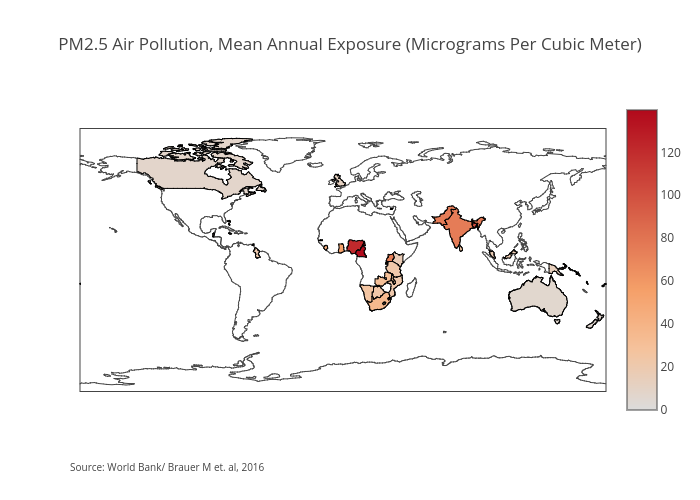 Between 2010 and 2016, Commonwealth countries in the African and Asian regions showed the highest levels of exposure to air pollution. During this period, the highest annual exposure was in Cameroon, registering at 139.7 micrograms per cubic metre (pcm) in 2016. The country that had made the greatest progress in reducing exposure of its population to air pollution in these seven years was Malta, with annual exposure falling from 14.6 micrograms pcm in 2010 to 12.1 micrograms pcm in 2016.